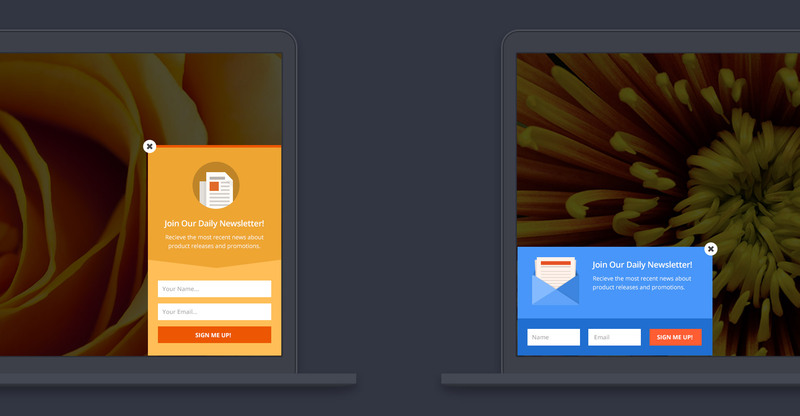 Similar to triggered pop-ups, fly-ins are another great way to grab your readers’ attention. These can be triggered by specific user interaction such as timed delays, at the end of a page, or even after someone leaves a comment or makes a purchase. Choose from 10 different ways for your opt-in fly-in to animate onto the screen. There are 6 different user interactions that can be configured to trigger your fly-in. You can have your opt-in fly-in display in either the lower left or right corner of the browser. Target specific user interaction with Bloom’s automatic opt-in triggers to hone in on your audience for even higher conversion rates. Choose a timed delay for your pop-ups and fly-ins so that they trigger after your readers have been on a page for a specific duration of time. Displaying opt-in forms to readers after commenting on a post or page is a sure way to target visitors who are clearly engaged with your content. readers reach the bottom of a post or page and give your readers a friendly reminder to opt-in. Offer updates on future products and promotions by triggering an opt-in form your purchasing visitors right after the checkout process. Use this trigger to display your opt-in forms only after the a visitor scrolls a defined percentage of the way down your page. If a user is inactive on your page for too long, Bloom can be triggered to re-catch your visitor’s attention with a pop-up or fly-in. If you are looking to grow your email list, now’s the time to do it. Download Bloom today, and start building a stronger and more engaged community around your website.